I’ve been aware of Trilogy as a brand for some time, but mostly in relation to the Rosehip Oil which has won many awards – and yet I hadn’t tried any Trilogy products until now. The Trilogy Refresh & Shine Shampoo contains Keracyn™ which protects your hair by coating the hair shaft with a restorative botanical shield. It contains Calendula which brightens as it rinses away excess oil and product build up. It also contains marshmallow for shine, rosehip for condition and chamomile to sooth the scalp and make hair more manageable. I’ve been trying to find the perfect shampoo for quite a while. I’m not sure if this is the one but it does do a great job at making my hair feel squeaky clean and it certainly feels as if it removes product build up. This is something that I’ve had to address more as I’ve started to experiment with more hair products such as heat protection spray. Truth be told it’s really a conditioner or hair mask that that I’ve been looking for. So I was looking forward to seeing what the overall effect would be when I used Trilogy Refresh and Shine Conditioner following on from using the Trilogy shampoo. It claims to effectively de-tangle your hair by smoothing hair cuticles, leaving your hair easy to manage and style. It contains Keracyn™ too as well as artichoke extract to protect your hair from sun and oxidisation damage; aloe vera for intense hydration and to preserve shine. It also contains rosehip and chamomile. Did it wow me and give me the amazing texture and shine I was looking for? Well no, but it gave it a very good shot! My hair was definitely shiny and fragrant smelling but I still needed to use oil to make my hair feel weighty and glossy. To be fair I think that I need a treatment to kind of put my hair into rehab! These are great every day products for normal hair that hasn’t been overheated and stressed. 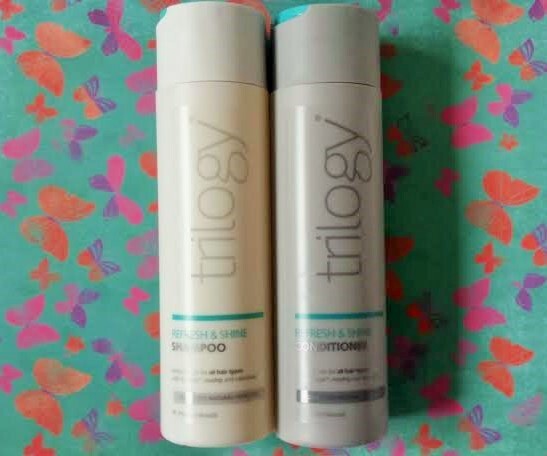 Do you love Trilogy products? What have you tried? This post contains affiliate links. The products were gifted for review but the opinions are my own and not prescribed. Haha! That’s true! I’m using them now so they’re on the side of the bath in full view. I suppose I’m just saying that I wouldn’t be drawn to them!